Oh, No, It’s Happening Again! Roy E. Finkenbine is a Professor of History and Director of the Black Abolitionist Archive at the University of Detroit, Mercy. Once a generation or so, usually amid the stresses of war or international conflict, Americans abandon their collective identity as the “asylum for mankind” and target otherwise unoffending ethnic populations either already here or coming to our shores simply seeking the fruits of freedom. At present, it is the Syrian refugees. Two generations ago, the federal government interned patriotic Japanese Americans in camps during World War II. As Europe hurtled toward war in 1939, the U.S. refused entry to a transatlantic liner full of political refugees (mostly Jewish) fleeing Nazism, compelling them to return to Europe. 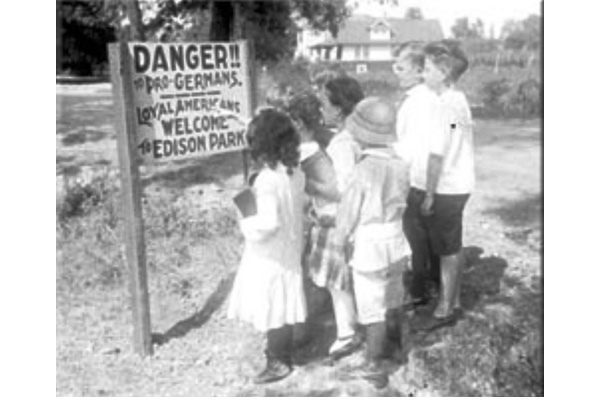 In a poll by Fortune magazine a year earlier, two-thirds of respondents agreed that “with conditions as they are, we should try to keep them out.” A generation before that, German Americans faced fear, mistreatment, and a sort of cultural purge during World War I. There are plenty of earlier examples. This aspect of our national experience came to the forefront of my consciousness over the past several days as Americans responded to the Paris attacks. At the time, I was reading Burning Beethoven: The Eradication of German Culture in the United States during World War I by Erik Kirschbaum – a coincidental but very instructive choice. As Kirschbaum shows, immigration from Germany throughout the nineteenth century made German Americans into our largest ethnic population by the beginning of the twentieth. The German language could be heard and German cultural influence felt throughout much of the nation, especially in the Midwest. Many families, churches, schools, businesses, and cultural institutions operated largely or exclusively in German. Some 488 German-language newspapers were published in the U.S. in 1910, with a combined readership of 3.4 million. “A century ago,” Kirschbaum notes, “German influence in the United States was more dominant than Hispanic influence is now.” This influence was tested as America entered World War I against Germany in early 1917. By the time the Armistice took place in late 1918, much of German-American “Kultur” was gone. Recalling the vibrant German-American community in pre-war Indianapolis, Kurt Vonnegut charged that it had been “lobotomized” as a result of the conflict. With the U.S. at war, Germans and German Americans quickly came to be viewed as the enemy. In this atmosphere, all things German were verboten. German soldiers were caricatured in posters as barbaric rapists (think Donald Trump on Mexican immigrants). Both in the press and in the minds of millions of ordinary citizens, German Americans were disloyal at best, spies at worst. The response was swift and palpable. Mobs killed several ordinary German Americans out of fear that they were working for the Kaiser; dozens more were tarred and feathered. The eradication of German-American culture proceeded apace, often with government assistance. German-language newspapers were censored, vandalized, and in many cases shuttered. They never recovered. The teaching of the German language ended in many schools and colleges. Books printed in German or by German authors were pulled from the shelves of many libraries and schools and destroyed in book burnings. Several state legislatures outlawed preaching in German; congregants were encouraged to make the authorities aware of violators as a patriotic duty. Towns, streets, businesses, and even families with German names were renamed or Anglicized (Berlin and Frankfurt had to go). Compositions by Beethoven and other German composers were banned from concert halls. German foods were renamed – sauerkraut became “liberty cabbage.” The pre-war dominance of German beers fueled the movement toward national prohibition of alcoholic beverages. A few self-appointed vigilantes even slaughtered dachshunds and German shepherds out of a dislike for all things German. My own German-American ancestors experienced many of these changes wrought by the war. The Finkenbines left Baden for the wilderness of western Ohio in 1833. For more than eight decades prior to the conflict, they worshipped, prayed, memorized Luther’s Small Catechism, conversed, courted, studied, raised families, farmed, and conducted business in German. Wartime paranoia about the “Hun” radically altered their behavior. My late grandmother, a young farmwife in her early twenties when the war begin, recalled how the family avoided visiting Sidney, the county seat, for shopping or social events during 1917-1918 because of their expectation of the stares, catcalls, or even rough behavior they might face from residents of non-German descent. Family members made a feeble attempt to Anglicize the name, changing Finkenbein to Finkenbine. English became the language they used most often in public; they spoke German less frequently at home. In time, those of my father’s generation largely abandoned their German-speaking heritage. Even their preference for German beer and foodways slipped a bit. Today, our cultural origins are suggested only by our family name and our fondness for Lutheranism. Why do Americans suffer these paroxysms of paranoia in times of stress? Why do we so often abandon our collective national values and target ethnic populations in the face of societal evidence to the contrary? Both Japanese Americans in World War II and German Americans in World War I were extremely patriotic. Writing at another time of stress and international conflict – the post-World War II Red Scare – President Harry S. Truman used the metaphor of America suffering from a chronic mental condition. “When we have these fits of hysteria,” he observed, “we are like the person who has a fit of nerves in public. When he recovers, he is very much ashamed and so are we as a nation when sanity returns.” Dr. Truman only offered a diagnosis, however, not a treatment. As the nation, driven by fear rather than evidence, demonizes the Syrian refugees (and Muslims in general), one wonders how and when our collective sanity and sense of shame will return.